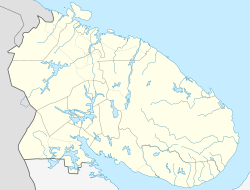 Murmansk (Roushie: Му́рманск; Kildin Sami: Мурман ланнҍ; Northren Sami: Murmanska; Skolt Sami: Muurman) is a ceety an the admeenistrative centre o Murmansk Oblast, Roushie. It serves as a seaport an is locatit in the extreme northwast pairt o Roushie, on the Kola Bay, 12 kilometres (7.5 mi) frae the Barents Sea on the northren shore o the Kola Peninsulae, no far frae Roushie's borders wi Norawa an Finland. Population: 336,137 (2002 Census); 468,039 (1989 Census). Despite its rapidly declinin population, Murmansk remains the lairgest ceety north o the Airctic Circle. ↑ "Groningen — Partner Cities". © 2008 Gemeente Groningen, Kreupelstraat 1,9712 HW Groningen. Retrieved 2008-12-08. Wikimedia Commons haes media relatit tae Murmansk. This page wis last eeditit on 8 Mairch 2018, at 05:23.